I do beg you3 not to use the Fairchild4 sonnet.! As the tribute of a friend, even, it is not convincing, because it is so full of artificial, colorless phrases. Many a college undergraduate could do better. The sonnet is distinctly third rate as poetry. I had hoped that this would be an edition5 of Miss Jewett6 for writers. If Mme. Tchekova7, or Lawrence8, or Middleton Murray9 picked up these volumes and ran them over, the first thing their eye would light upon would be a tiresome piece of "old-lady-poetry." Why put a piece of feeble, foolish verse into a volume whose avowed excuse for being is its literary excellence? I wish you would read10 "Decoration Day. "11 It's simply one of the times when Miss Jewett didn't accomplish what she longed to do. It scarcely belongs in the second grade of her work, much less the first. However, if Miss Mary12 is set upon it13, and you feel that you must sconcede to her, put it in,; and I will, in that part of the preface where I say that the stories in Volume II are of unequal merit, simply say that I do not consider that one among her best, but include it at the request of friends. I'll try to word it niecely. But do not take out "The Hiltons' Holiday".14! I don't greatly love it, but Oone of the longest talks I ever had with Miss Jewett was about that story, and she felt strongly about it. I wonder what was the date of her letter to Mrs. Richards15? To me she spoke differently. When I told her that "Decoration Day" to me seemed more like other people's stories, she said with a sigh that it was one of the ones that had grown old-fashioned. You see, in the preface I've made a very high claim for these stories, and I can defend it with any really first rate writer of any country; but no critic, no writer, could make su such a claim for a conventional magazine story16 like "Decoration Day." If you have to include it, I must say it that it is done by request (which sounds foolish); or (otherwise) that one story would quite invalidate the preface. About this story you must do as you think best. I wish you could omit it. But Aabout the Fairchild sonnet I can't compromise- - - what has an "occasional" sonnet to do with a literary work, even if it were a good sonnet.? If you use the sonnet, I must withdraw the Preface altogether. I won't be one bit disagreeable about it, you understand,—but I shall be firm. Won't you take this up with Miss Mary17? As an editor, with a publishing interest, you will have more influence than I. 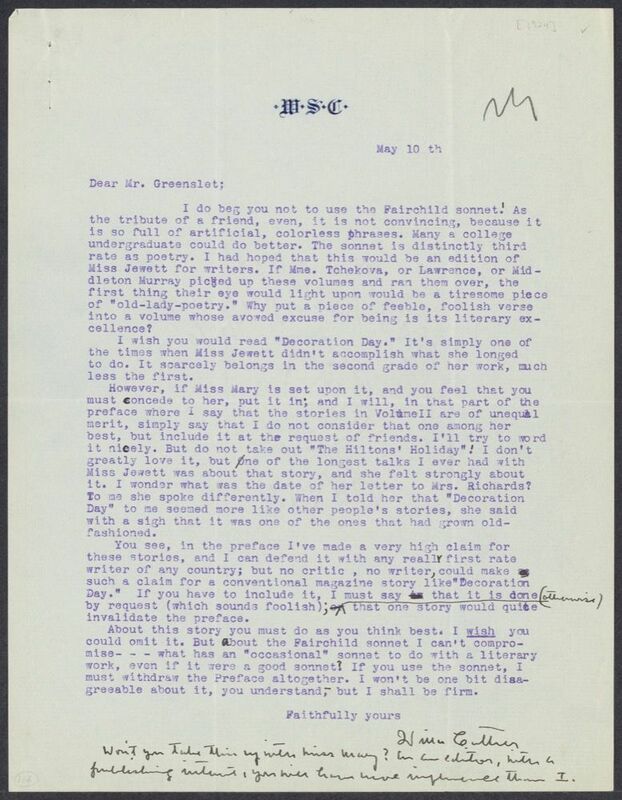 On 8 May 1924, Greenslet asked Cather what she thought of Mary Jewett's suggestion that the "Fairchild sonnet" be used in the front matter (he endorsed it as "felicitous"). It seems that Mary Jewett sent the poem directly to Cather, and no copy has been preserved. Although Fairchild published poetry, it may have been an unpublished poem commemorating the deceased author. On 8 May 1924, Greenslet asked Cather whether she was "agreeable" to Mary Jewett's suggestion that "Decoration Day" replace "The Hilton's Holiday" in the selection of stories in volume 2 (see #0729). On 30 April 1924, Mary Jewett wrote to Ferris Greenslet suggesting that "Decoration Day" be substituted for "The Hilton's Holiday" based on a statement by Sarah Jewett, written down by her friend Laura Richards, "I have often thought that if any thing of mine were to live I should like it to be Decoration Day." On 8 May 1924, Greenslet asked Cather what she thought of Mary Jewett's suggestion. The story was first published in Harper's Magazine in June 1892. On 19 May 1924, Greenslet informed Cather that Mary Jewett had agreed "most cordially to carrying through of the two Jewett volumes precisely on the original plan" devised by Cather. Fairchild, Elizabeth Nelson (1868-1925). American poet, painter, and salonnière. Born in Boston, MA, Elizabeth Nelson married banker and stockbroker Charles Fairchild in 1868; they had seven children. Before her marriage she published magazine verse as Lily Nelson and afterwards under the pseudonym C.A. Price. She also conducted a salon at her house and painted animal subjects. 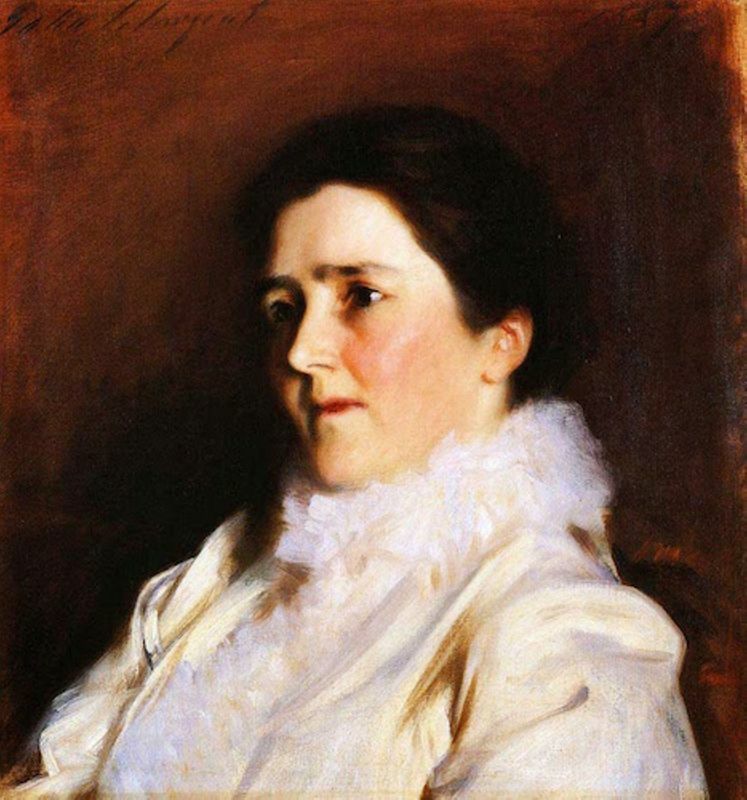 Among her friends in artistic circles were Robert Louis Stevenson, John Singer Sargent (who painted her portrait), Sarah Orne Jewett, and Annie Adams Fields. Cather may have met Fairchild in Boston through Fields and Jewett. Knipper-Chekhova, Olga Leonardovna (1869-1959). Russian actress. Olga Knipper was best known for originating roles in the plays that made playwright Anton Chekhov famous. After her success in Three Sisters (1901), she and Chekov married, and Knipper-Chekova originated the role of Madame Ranevskaya in The Cherry Orchard (1904). She continued to act after her husband’s 1904 death, including on a tour of the Moscow Art Theatre in the United States in 1923-24. Cather spent "two remarkable evenings" with Knipper-Chekhova in 1923 (see #0672). Murry, John Middleton (1889-1957). British critic. Born in Peckham, England, John Murry attended Christ’s Hospital from 1901 to 1908 and studied classics at Brasnose College, Oxford. In 1912 he began a relationship with Katherine Mansfield, promoting her fiction in Rhythm, a modernist periodical he founded. In 1915 he and Mansfield and D. H. Lawrence founded the short-lived periodical The Signature. 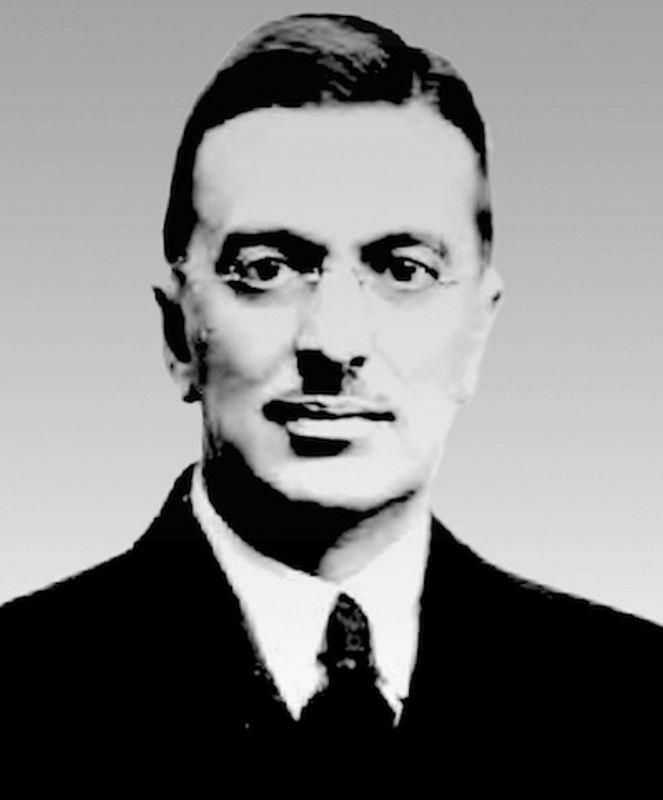 A prolific critic, Murry reviewed literature and art for the Westminster Gazetteer and the Times Literary Supplement and published many volumes of literary criticism and cultural commentary, including Dostoevsky (1916), The Problems of Style (1922), The Necessity of Communism (1931), Between Two Worlds (1935), and The Necessity of Pacifism (1937). He also edited The Adelphi and The Nation and Athenaeum. Murry reviewed Cather’s Youth and the Bright Medusa (1920) for Nation and Athenaeum on 14 April 1923. Richards, Laura Elizabeth Howe (1850-1943). American author. Born in Boston, MA, to Samuel Gridley Howe and Julia Ward Howe, Laura Howe married Henry Richards in 1871. 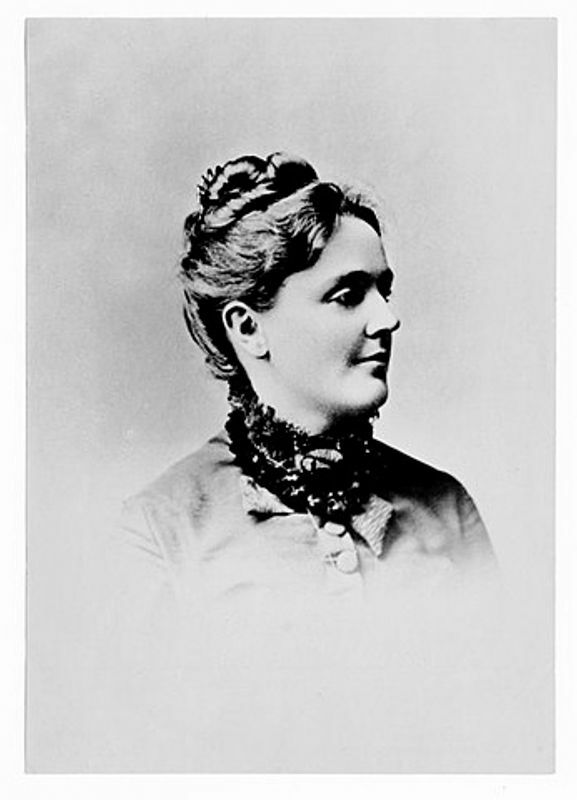 In 1876 they and their three children moved to Gardiner, ME, where, with the encouragement of Sarah Orne Jewett, Laura Richards dedicated herself to writing and became a prolific author of children’s books, poetry, and biographies. She and her sisters Maud Howe Elliot and Florence Hall were awarded the Pulitzer prize for their biography of their mother.